From posh (Chanel-themed fingertips, anyone?) to pretty (fabulous pink and whites), Bellagio is the new go-to spot for everything nails and waxing. Like its luxe name implies, Bellagio Nails & Spa boasts exceptional-quality products, guaranteed workmanship and Grade A sanitation. But what will keep you coming back is the outstanding service and truly gorgeous results. Plus, competitive pricing makes your next mani/pedi a luxurious necessity you can afford. Bellagio Nails & Spa is located in the Shops at Tourney in Valencia 260-3759. If your favorite words are prefaced with an "i" and, to you, "Apple" isn't a fruit - but a way of life - MacTalk is your kind of place. 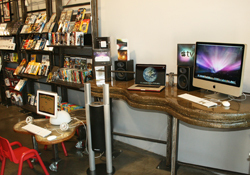 From MacBooks to iPods and everything in between (including incredibly-priced used Macs! ), MacTalk has some of the best technology Apple offers all in one location. Plus, the knowledgeable and super-friendly Apple Specialists provide on-site and expedited services so that you're fluent in MacTalk, too! MacTalk is located in the Shops at Tourney in Valencia 253-4005. There's convenience, and then there's Mailboxes N More. This one-stop locally-owned super shop has it all: mailbox rentals, a notary, shipping services, key duplication and Livescan fingerprinting plus high-quality (and discounted!) printing, color copies (only 25 cents! ), binding, laminating, full-color banners, business cards, post cards, brochures, real estate flyers and more. Clean, friendly and easy to navigate, Mailboxes N More is your new "errand" store. 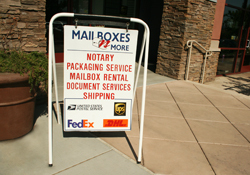 Mailboxes N More is located in the Shops at Tourney in Valencia 254-6245. The world's finest, fresh fire-roasted gourmet pizzas can now be found in the SCV. Sink your teeth into RedBrick Pizza's delicate golden crust and delicious thin crisp center. Full of flavor, it's also healthier and tastier than your average pie. Topped with premium ingredients, the hand-rolled dough is made fresh daily with good-for-you olive oil. Your pizza is finished in a RedBrick oven that sears your pie at more than 1,000 degrees in just three minutes! 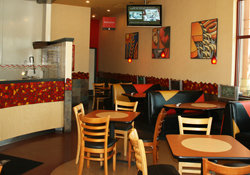 RedBrick Pizza is located in the Shops at Tourney in Valencia 287-3131. "The best things in life are wings" for lunch or dinner! Saucey's Wings & Fries serves up the biggest, baddest wings you've ever tasted with chef-made sauces created daily. Choose from Country Gravy, Garlic & Parmesan, Sticky Lemon, Smokey BBQ, Hoisin, Black Peppercorn, Honey Chipotle, Creole, Buffalo or the king of all hot sauces: Habanero Mango. Plus, Saucey's uses fresh Kennebec potatoes for fries that are cut, cooked and seasoned right on the spot. 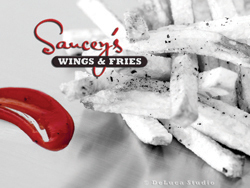 Saucey's Wings & Fries is located in the Shops at Tourney in Valencia799-WING (9464). SCV Cleaners is the first choice of the pros. Now, with two environmentally-friendly locations in Valencia and Canyon Country, this family-owned company has doubled their ability to provide you with superior customer service and crisp, pristine-clean results. Classy dressers will love their old-world Italian tailoring service, made even better when combined with SCV Cleaner's commitment to offering free pick up and delivery at your home or office. 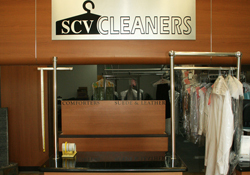 SCV Cleaners is located in the Shops at Tourney in Valencia 288-1112. 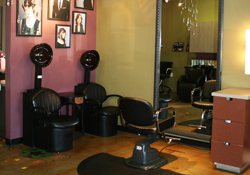 If you are ready to be inspired and love the way you look, take a spin in any chair at Shannon Hair Salon. With on-going education from world-renowned academies like Vidal Sassoon, Toni&Guy, and Bumble and bumble, the stylists at this hip salon are on top of the latest trends and techniques to help bring out your own individuality and give you the tools to maintain your look. Shannon Hair Salon is located in the Shops at Tourney in Valencia 799-7272.